When I was a young art student, I had a big art poster of the famous artist Theodor Kittelsen’s picture of the Norse water spirit “Nøkken” in the form of a white horse in my bedsit. I loved the timeless, mysterious fairytale mood of it. 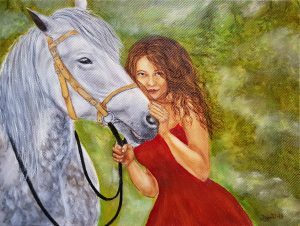 My horse is probably not a water spirit, but I wanted to give this painting a slightly timeless fairytale feel, but with a strong woman (not one of these fairytale princesses that just sits there waiting for a prince). I don’t think I’ve painted a horse since primary school or therabouts, so I am just hoping this is of an acceptable standard for all of the horse lovers out there!